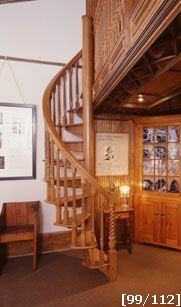 The staircase is 40" diameter solid red oak with 22 1/2" degree treads making a half turn from the first tread to the finish floor above. The handrail is # 235 (2 1/4" x 2 3/8"); balusters are # 338 (1 3/4" square) with a spiral twist, two per tread. The first tread has a 3" square newel post to match the balusters. The treads are # 142 (1 1/2" thick) with nosing and the center column is a 5 1/4" diameter with a custom shape. The staircase is assembled at our plant for a perfect fit and then disassembled and packaged for shipment. The wood was finish at the job site.